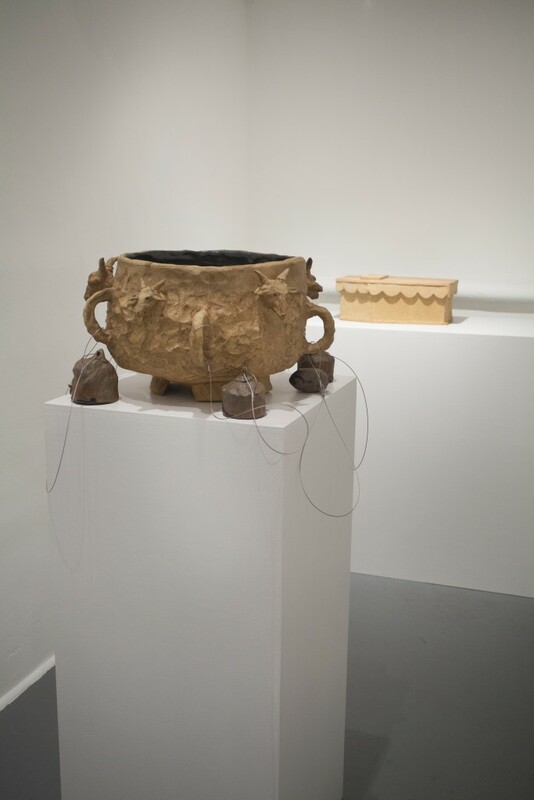 Installation view, Ever Gold Projects, 2016. Tom Sachs, Freeda, 2014. English porcelain, high fire reduction, Temple white glaze, NASA Red engobe inlay, 3.375 x 4.5 x 4.125 inches. Tom Sachs, Breakfast, 2016. Wood, steel, stoneware, porcelain, toaster, tv, pirated DVDs, water boiler, coffee, sugar, maple syrup, whiskey, stereo amplifier, speakers, surveillance cameras, loudspeaker, epoxy resin and fiberglass. 70 x 42 x 30 inches. JJ PEET, Brickvace 34, 2015. Porcelain, 9 x 9 x 11 inches. JJ PEET, BRICKVACEVEST, 2015. Mixed media, 46 x 18 x 8 inches. Pat McCarthy, Air Carrier, 2016. Porcelain, plastic, copper, 11 x 8 x 12.5 inches. 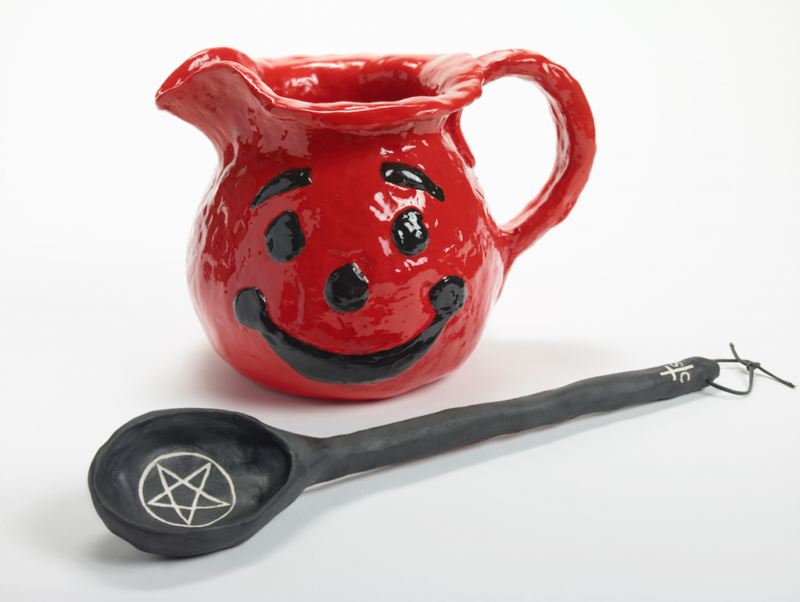 Mary Frey, FightEvil (Kool Aid with SC spoon ), 2016. English porcelain , Blood Red + Death metal engobe , luster. Satan Ceramics, Tenderloin Edition, opening January 23, 2016 at 7 pm. 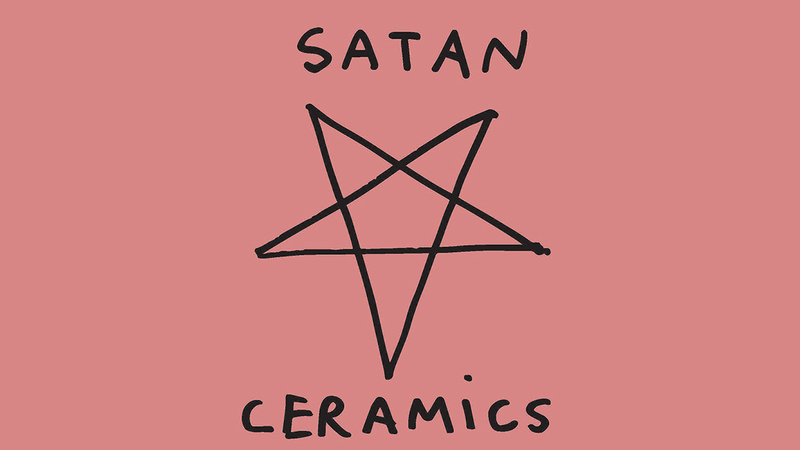 Satan Ceramics is Mary Frey, Pat McCarthy, JJ PEET, and Tom Sachs. We meet every Wednesday night. Our lives (like every one else’s) get in the way. Family, teaching, travel, and other work responsibilities hamper us. But the sessions do happen. And we all have relationships with each other individually. Mary and I speak everyday. Mainly just to complain about our aging bodies, how much we hate ceramics, and how tired and hungry we are. Pat and I talk every weekday since we work together at my studio. But we also spend a lot of time raving about AVE, our favorite YouTube channel and the smartest idiot on the Internet—he “scientifically” and critically disassembles a Makita hypoid saw and comments with great profanity. JJ and I talk about life, work, and making as much as our schedules allow. JJ is the busiest of all of us since he teaches at the 92nd Street Y and Columbia University and who knows where else. We always eat together. Centre Street is our clubhouse. Of course the work influences each other. And we have a gentle rivalry. I’m always stealing JJ’s ideas. Mary is always stealing my Dolan ceramics knife. And Pat is always feeding his pigeons. We all talk about business, love, lust, and craft. And we all agree plywood is the queen of all building materials. 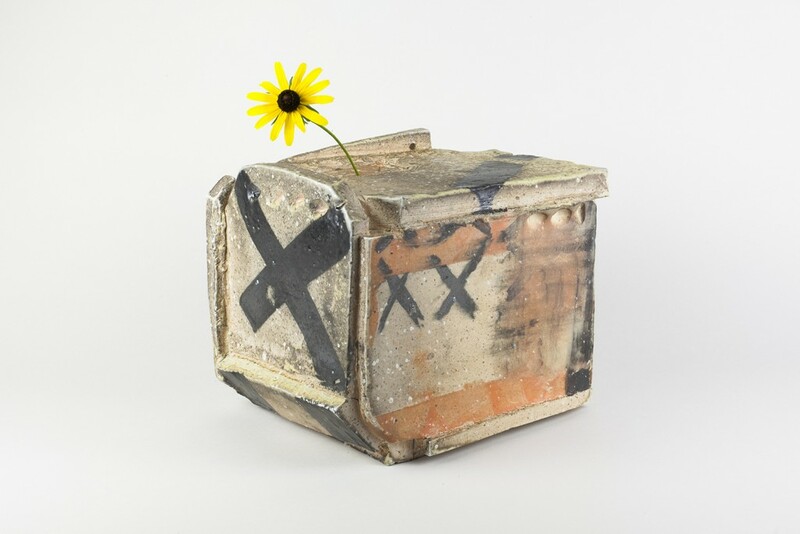 The artists use ceramics with other materials that are often non-traditional media. A porcelain Grecian urn for the distribution/consumption of WD-40 (general purpose lubricant) complete with red titanium drinking straw by Tom Sachs is functional, although it is presented like an artifact. JJ PEET’s sculpture Eyeball (2015) functions as a passport for transportation to another universe. Frey’s porcelain skateboard is equipped with actual trucks and wheels though it is unrideable. The handmade version takes on another media fully, transforming and elevating the modest wood board. The porcelain nesting bowls of Pat McCarthy are intended to be filled by his pigeons with twigs, leaves, and dirt, the ideal bed for laying eggs. McCarthy’s bowls are meant to nurture new life, and have a use value in the physical world outside that of the artist. In Frey’s last exhibition she focused on mementos of suburban America that indicate family values, contemporary sexual mores and idiosyncratic personal freedoms. For this presentation of Satan Ceramics, she has turned her focus to the persecution of the midwives, scientists, and healers, known as witches. 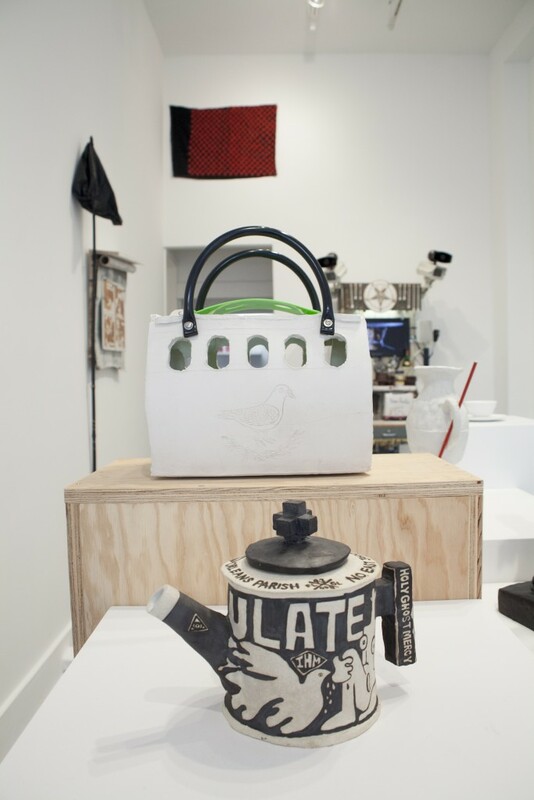 In Immaculate Heart of Mary (2015), a teapot commemorates the devastation of her grammar school by Hurricane Katrina. But instead of lamenting its loss she bitterly celebrates its destruction as a catharsis from the site and memory of an abusive and corrupt educational institution. The centerpiece of the exhibition, The Crucifixion (2016), depicts the three other artists in caricature surrounding Mary Frey on the cross. In this work she identifies herself as martyr, in sentiment as the overworked mother and muse but also as a woman who has, like the witches, been misunderstood, whose good deeds have, out of fear and misunderstanding, been confused for bad intentions. 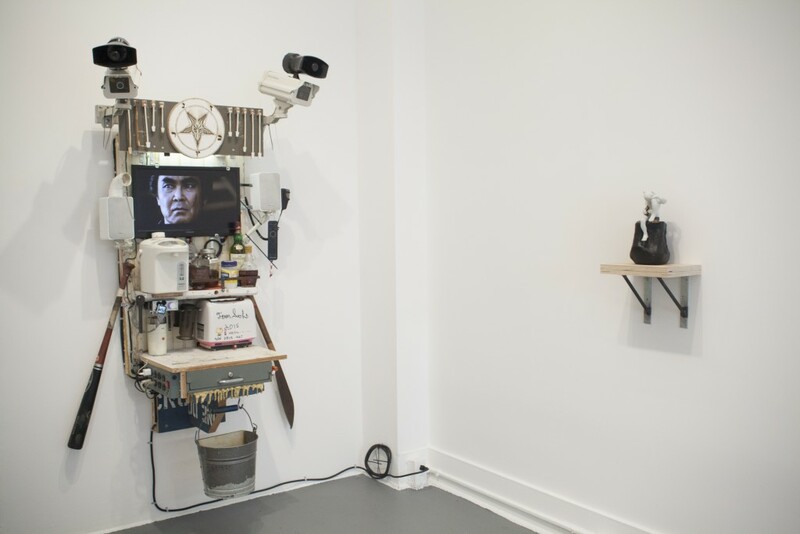 Blow torch (2015), which includes a portrait of her daughter as good witch, Possession, and Connecticut Safe Box all contain this sentiment yet reflect different aspects of cultural and institutional misogyny. 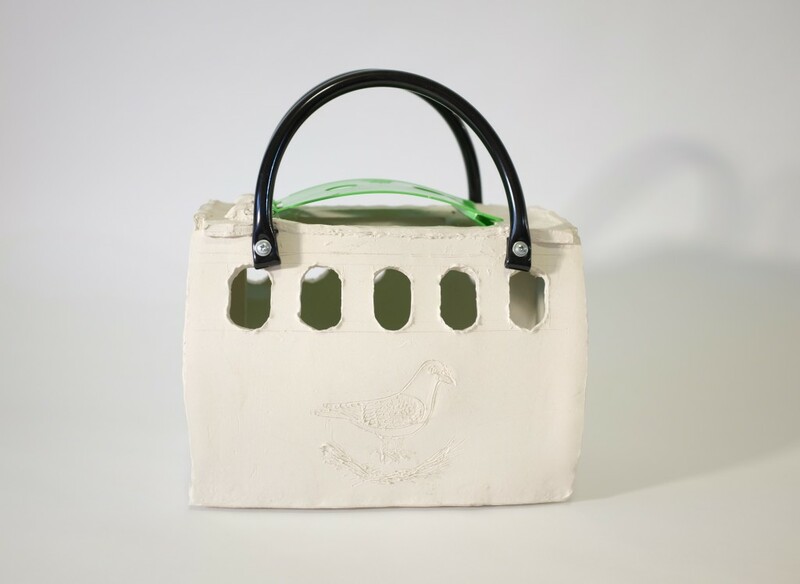 Pat McCarthy’s object-making is bound to the framework of his pigeon-keeping practice. On the roof of his Brooklyn studio stand several coops housing hundreds of trained pigeons with whom the artist endure a daily stewardship. In recent years this environment has become his Gesamtkunstwerk—or, total synthesis of arts and life as a revolutionary and all-embracing kind of art practice. The Coops are Bauhaus-like in form, though the details of the structures reveal eccentric use of materials—bamboo, tar paper, and reindeer furs overlap walls of plywood and steel. Inside, the birds’ “furniture” and living systems are primarily ceramic, including their feeders, perches, and bowls for nesting. Pigeons see in the same color spectrum as humans, and McCarthy’s choices of color on the ceramics are not aesthetic, but rather a means for each pigeon to identify his or her personal object. The objects and experiences created on the roof are documented in the artist’s serialized fanzine, Born to Kill. The zines simultaneously articulate the rituals of the pigeoning practice and explore broader metaphors of urban life. PEET’s clay objects have latent binaries like water/blood, life/death, build/destroy. 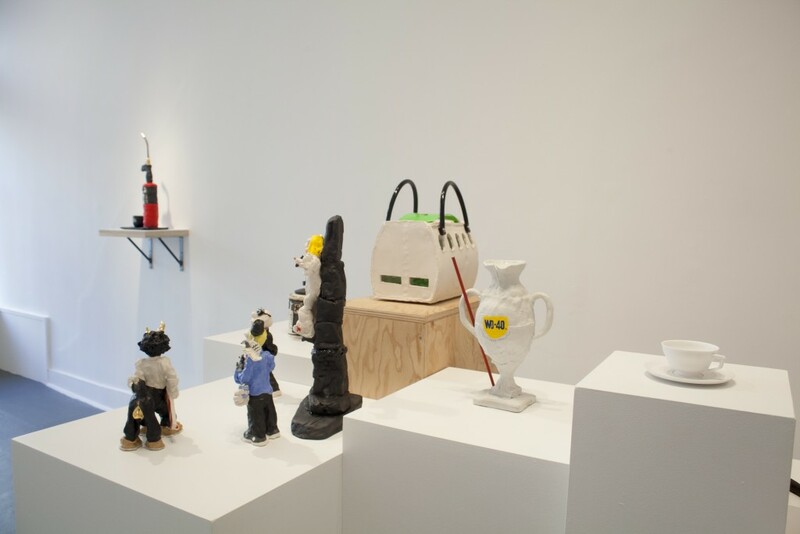 PEET’s objects contain inherent volatility and potentially harmful politics, which connects them to our contemporary world of unstable ﬁnancial markets, global politics, and a changing environment. His Brickvasevest (2016) contains 18 brick vases and a “viewer”. 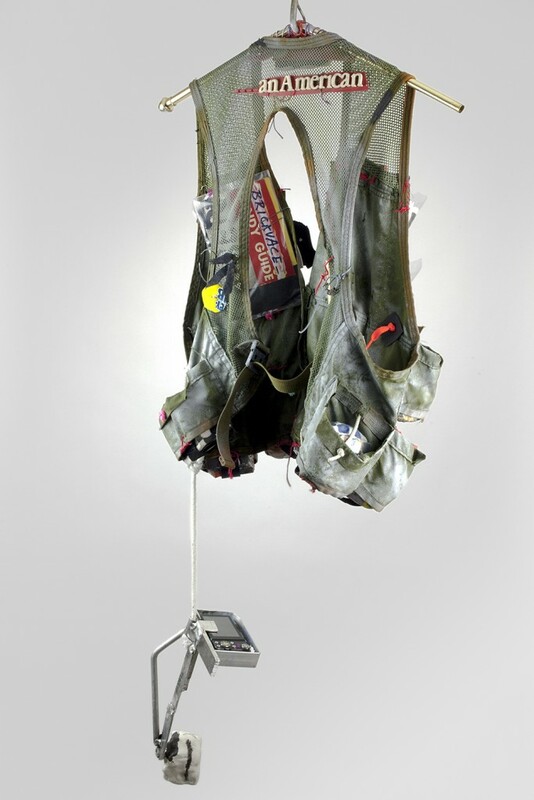 This American bricolage masterpiece could be seen as a terrorist’s bomb vest, a photo gaffer’s lens vest, or the garment of a priest containing the holy sacrament. PEET’s manifesto of ceramics—“Brain to Hand to Object”—considers how closely tied the body is to the material, and vice versa, the various ways that the object affects the body like an appendage, a system or a life cycle. Sachs’ practice is rooted in absurdist functionality, engineering, and the spirituality of labor. He builds whole environments where individual objects are experienced as part of a ritual or system. All materials, processes, and scars of labor are left exposed. Conflating rocket engineering with ancient tea ceremony rituals, Sachs has made hundreds of hand-formed porcelain tea bowls (chawan). 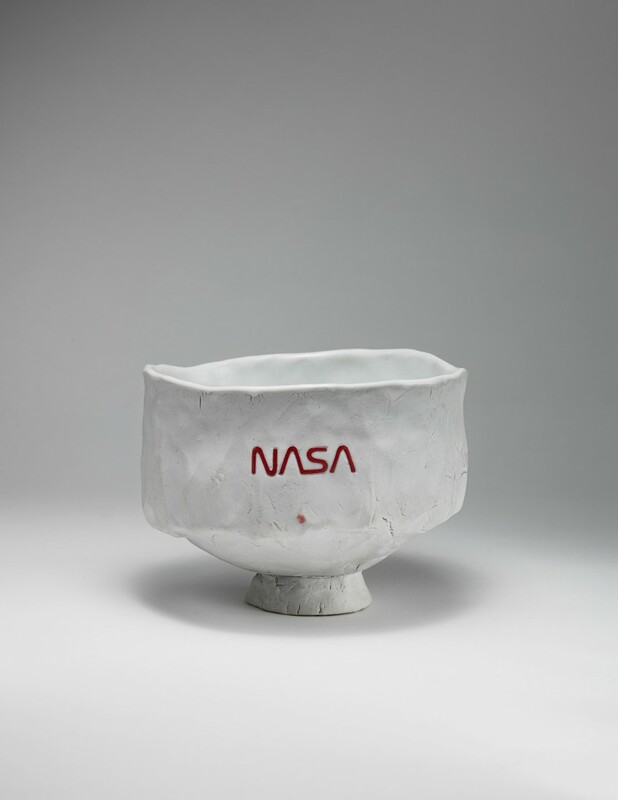 The bowls are used in the studio, and in his tea ceremony (debuting this March, Tom Sachs: Tea Ceremony 2016 at the Noguchi Museum in New York). Of the hundreds of bowls made only 20 have been chosen as heroes and given names. 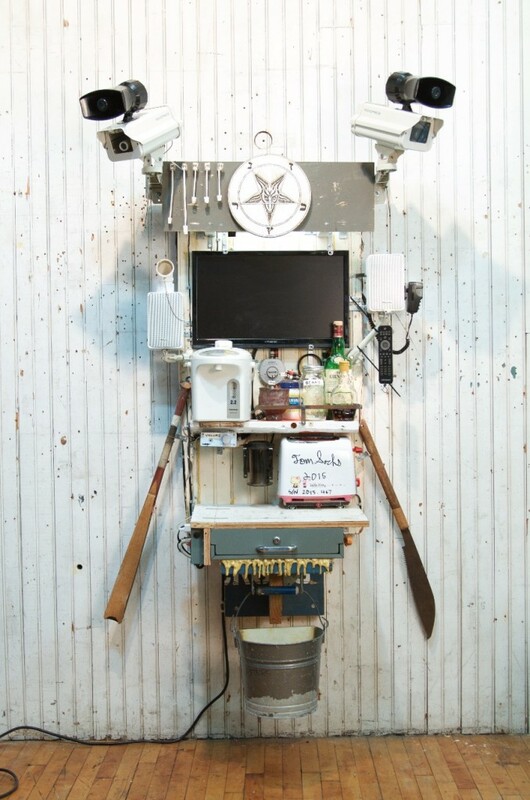 Sachs presents a new major work; Breakfast (2016) is a large wall-hung breakfast station complete with toaster, coffee maker, and home pirated DVD library. The marquee boasts a large baphomet (the symbol of Satan). A police PA system, baseball bat, and dozuki saw all come together to form a Dionysian breakfast experience. Breakfast also supports a loud sound system, (and as such becomes a boombox) whose playlist reflects the four artists’ shared love of the music of the dark lord, whose message is not that of Republican baby-eaters, but of those who learn to trust their own instincts enough to make just the right “wrong” decision. Sound from Breakfast ﬁlls the gallery, reproducing the atmosphere of the workspace the artists share in their process of making. Satan Ceramics’ first exhibition was at Salon 94, whose enthusiastic support we gratefully acknowledge, from September 14 – October 25, 2014. 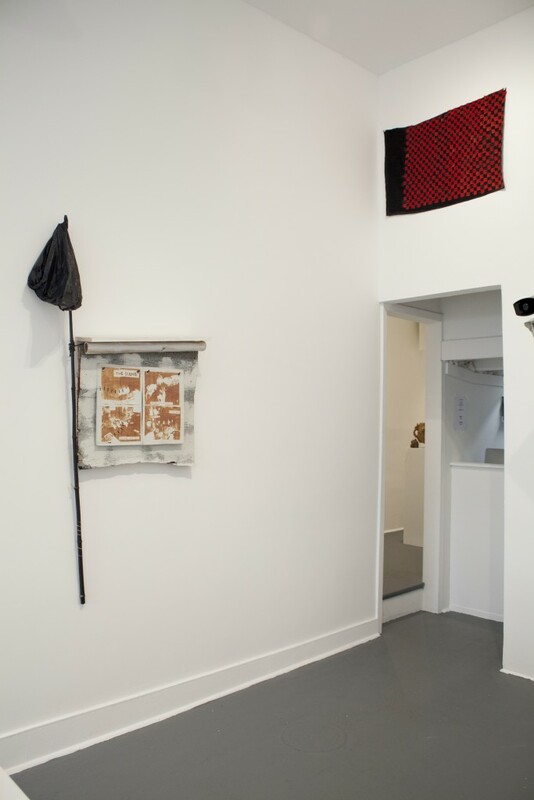 Ever Gold [Projects], formally know as Ever Gold Gallery, is located at 441 O’Farrell Street, between Taylor and Jones in the heart of the Tenderloin district, San Francisco. Open Friday and Saturday 11 to 5:30, and by appointment Monday through Thursday. 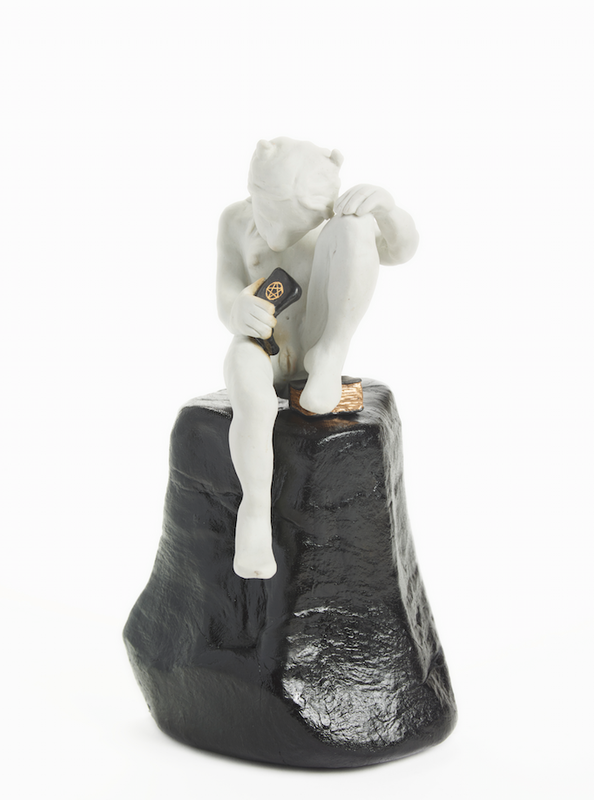 Mary Frey, Self Examination, 2015. English porcelain , death metal Engobe , luster , resin and fiberglass.